Before we delve into the kill command what is important to know is how to get the PID of a process. There are a few ways of doing this but probably the most direct is to use the ps. Full discussion of the ps command is beyond the scope of this entry and ill be covered in a future episode. That aside there are a few switches to be aware of to help you identify the PID of a process you may need to kill. The full-format switch will provide you with the name of the user the process is running under along with some other information. There are other ways to find the PID of a command like using top or digging through the /proc directory. This will send the SIGTERM signal to process 1250 which will attempt to terminate the process. Signals will be discussed in a minute. SIGHUP – 1 – Hangup – SIGHUP tells the process that the controlling terminal has closed and the process should be terminated. If the process is a daemon then usually this will cause the daemon to re-read the configuration file. SIGQUIT – 3 – Terminal Quit – This is the termination signal sent to the process when the user requests the process perform a core dump. This does not necessarily make a core dump. SIGKILL – 9 – Kill – This signal tell the process to terminate immediately and cannot be caught or ignored and no clean-up is performed when the signal is received. SIGTERM – 15 – Termination – This is the default signal sent to a process by the kill command. It tell the process to terminate. This signal can be caught or ignored by the process and allows for the process to release resource and state saving where appropriate. SIGSTOP – 19 – Stop executing – This will stop a process, equivalent to <ctrl>+<z> and cannot be caught or ignored. Process can then be resumed with the SIGCONT signal. SIGSTP – 20 – Terminal Stop Signal – Like SIGSTOP, the process is sent the SIGSTP signal to temporarily stop. The process can then be resumed with the SIGCONT signal. Consult the biblography below for more information on what these signals mean and do. Of the signals above chances are you will only use SIGTERM and SIGKILL. This will send the SIGKILL signal to the processes with the PID’s listed. If you pass 0 as the PID kill will send the signal to every process in the process group that you executed the kill command from. Doing this will effectively terminate your terminal or console session and any processes that were spawned from that session. kill -0 3299 ; echo $? Using -1, by itself, will send the signal to every process that you have permission to kill. You do not want to do this as this will effectively terminate your entire session more than likely requiring a reboot. A value of -n where n is greater than 1 will send the signal to every process in the process group identified by -pid. 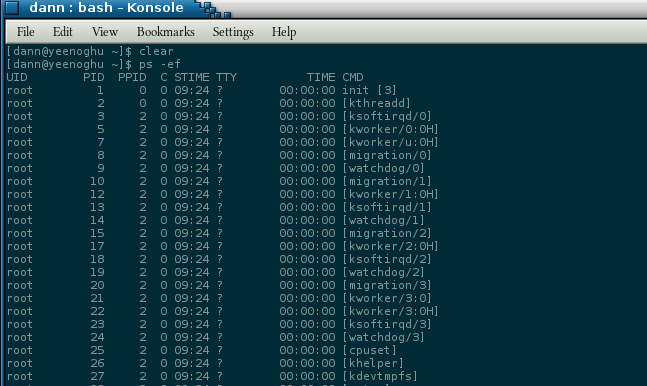 You would see more processes running that PID’s that would be returned by the mentioned command. But if you passed those PID’s from the -p switch to the kill command it would terminate Chromium completely. This will kill all processes named firefox. You should see 5 worms squiggling about each with 10 characters in length. worms -d 75 -n 4 : creates 4 little squigglers running amok in your terminal! Now where ever your worms squiggle to they will leave behind a “.” eventually filling up the terminal. The terminal will fill up with the word WORM over and over and your little squigglers will eat their way randomly around the terminal leaving a blank space, or a “.” if you specified the -t switch, behind them. To exit the worms program simply press <ctrl>+<c> or better yet, practice the kill command from above on your worms sessions! 3 Responses to Episode 019 – Kill the worms! Do you plan to convert to opus? Am I going to support the opus codec? That all depends on whether HackerPublicRadio will support opus. I will start looking at it now. 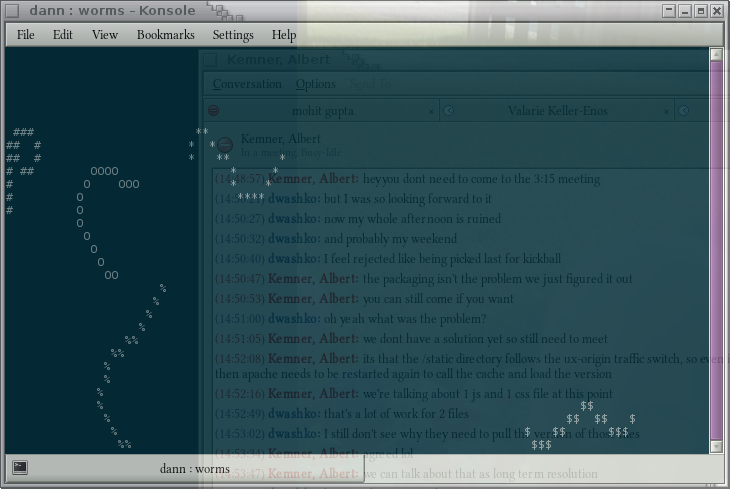 pkill is a nice program also.